Written by Dr Tristan Ewins, published by John Lord. 1) Capitalism is an economic system based on the private ownership of the means of production, exploitation of labour by Capital, and markets as vehicles for distribution and exchange. 3) Capitalism as we know it has the benefit of promoting innovation through the dynamics of competition; The competitive market system drives capitalists to innovate and respond to the intricacies of consumer demand. It also leads to the development of the means of production. Canadian economist Jim Stanford estimates that ‘the capitalist class’ of top owners and management dominates control of the economy despite only comprising about 2 per cent of the population. This has implications for the viability and meaningfulness of democracy. Capitalism has also always involved a ‘business cycle; characterised by fluctuations in consumer demand and investor confidence. This could be sparked by the collapse of investment bubbles and the spread of ‘bad debts’; and in response to the use of interest rates to contain inflation , or because of ‘supply shocks’. (eg: the Oil Shocks of the 1970s). And these crises spread in the context of world capitalism because of increasing global economic interdependence. At its worst this has occurred in the context of Depression , and more recently with the Global Financial Crisis. These were only eventually overcome in the context of stimulus , government guarantees and other interventions , and in the past (eg: WWII and post-war reconstruction) also because of the ‘boost’ provided by rearmament and war. The Great Depression put paid to the economic Liberal argument that ‘perfectly free markets’ ensured the full mobilisation of all ‘factors of production’. Arguably the right kinds of stimulus, intervention and regulation can reduce the severity and duration of the associated downturns. This includes what Keynesians call ‘demand management’. Downturns are a good time to invest in infrastructure, for instance ; though there are arguments to invest in productivity and quality-of-life enhancing infrastructure outside of that context as well. Indeed stimulus can create ‘a multiplier effect’, creating jobs indirectly as well as directly. But government (or ‘the people’) should not shoulder all the costs and risks, here ; with little in return. Some of the concerns socialised to restore stability during the GFC should arguably have remained socialised. 6) Left to its own logic capitalism leads to economic monopolisation or oligopolism – which in turn can lead to the abuse of market power. It also leads to systemic inequality. Though this can be ameliorated through labour activism, labour market regulation, progressive tax , and the social wage and welfare systems. And also by competition policy ; or enforcement of competition via Government Business Enterprises with charters on promoting competition. Again, though, the ‘capitalist class’ as such comprises only 2 per cent of the population ; and yet has the power directly or indirectly to veto any public policy through destabilisation and/or a ‘capital strike’. Unless ‘the people’ are sufficiently conscious and organised to oppose those strategies. 7) Nation States also pursue their economic interests attempting to extend their economic sphere of influence through control of – and access to -markets in other countries (including key strategic resources) ; or in the past through more direct expansionism. This can involve military force or economic and cultural pressure ; and was described by the British liberal social theorist John.A.Hobson as “Imperialism” ; a term which was then seized upon by Vladimir Ilyich Lenin to explain the First World War. 8) Marxists once believed in ‘absolute pauperisation’ and ‘absolute bifurcation’ under capitalism; with the destruction of the middle classes through the dominance of monopoly capital and the inability of small business to compete. In reality the ‘middle classes’ have re-emerged in diverse forms. Via the professional classes ; via emerging small businesses in new industries where monopolies have not yet consolidated ; and more recently as contractors who compete against each other to provide goods and services for monopoly capital , or in other contexts via small jobs for private consumers and households. Meanwhile, the working class generally includes all wage labourers – skilled and unskilled, manual and mental. The wealthy , and Ideological economic Liberals and capitalists, try to play the middle classes off against the working classes and the disadvantaged. As well as playing the working classes off against the most vulnerable with ‘anti-welfare’ narratives ; and using narratives around ‘political correctness’ as a wedge against the progressive liberal, social democratic and socialist Left. Also capitalists try and play manual labourers against intellectual labourers ; appealing to intellectual labourers that they are ‘middle class’. (and hence do not share the same interests) In democracies the challenge is to build a stable progressive electoral bloc to fight this. Swedish sociological theorist Walter Korpi referred to a ‘democratic class struggle’. Arguably Labor could do better to consolidate its support bases around the working classes and the vulnerable by playing more directly to their interests and challenging dominant Ideological themes; while maintaining the support of middle class liberals. 9) Current emphasis on ‘no real wage rises without productivity improvements’ leaves some labour-intensive professions (eg: cleaners) with little or no prospect of a real wage rise, ever. That is: without increases in the intensity of labour – a disturbing notion given we are already talking about some people who are engaged in hard and demanding physical work. Hence the creation of effective poverty traps. Workers in other areas like Primary and Secondary Teaching would also be hard pressed to achieve ‘productivity gains’. It also leads to absurd scenarios ; for example in higher education ; with academics measured by their ‘academic output’ ; often excluding deep thought and study of particular areas ; and getting in the way of good teaching. 10) Capitalism involves a dynamic of expansion ; Its survival depends on it. Waste at various points in the production process means capitalism must continually expand into new markets – or more thoroughly exploit old markets – to remain viable. That waste includes cost structure duplication because of competition, and also the cost of continual revolutionisation of the means of production to maintain competitiveness. There are also areas of unnecessary costs in areas such as marketing, dividends, executive salaries, and so on. Getting rid of this waste and duplication could arguably be qualitatively good for the economy, and for consumers : freeing resources to be deployed elsewhere. Decisions need to be made as to where natural public monopolies are viable (eg: transport and communications infrastructure) ; as well as where existing corporate competition (eg: Samsung versus Apple) actually does drive innovation which improves peoples’ lives. 11) There is also extensive waste in other areas. For example the fast food industry involves enormous waste ; and domestic food consumption alone also involves $8 billion of waste every year. But approximately 2 million Australians depend on food aid every year. Also there is the spectre of planned obsolescence (for instance white goods and electricals): that is, things are not made to last because that ‘would be bad for business’. This might warrant some kind of regulation re: minimum warrantee length for said electricals, whitegoods and so on. 12) But also there are limits to how far capitalism can succeed by extending its reach into new markets or more thoroughly exploiting old ones ; Over the past century capitalism has driven greater labour market participation: for instance that of women. It has integrated most of the world economy also. Now capitalists are demanding changes which grate against social democratic principles, interests and values. This led to what social theorist Jurgen Habermas called a ‘Legitimation Crisis’. That is, capitalism could not or would not deliver any longer on the post-WWII social democratic historic compromise. This was dealt with in the form of attacks of social democratic Ideology ; that is – convincing people to renounce their own social and industrial rights on the basis that neo-liberalism, greater inequality, privatisation, and austerity were ‘natural’, ‘inevitable’ and according to Margaret Thatcher that ‘There is no Alternative’. (‘TINA’) This also involved twisted Ideological narratives of individualism and meritocracy which ‘naturalised’ and justified inequality and exploitation. 13) In response to the systemic imperative to expand into new markets – or more thoroughly exploit old ones – capitalists are demanding increases in labour intensity, longer working lives, and longer working days. Capitalists are also pushing down on wages, conditions, welfare, the social wage and so on – to ‘create room’ for profits. 14) But this creates as many problems as it solves. Cutting welfare, the social wage, and so on may provide a short, local boost to profits of particular enterprises. But it also reduces consumer demand and consumer confidence , and probably increases the costs of crime. As well there is an intensification of inequality, and a hit to quality of life. We are producing more on this planet than ever; and yet we are told we most work longer and harder ; and not simply enjoy the benefits of greatly improved productivity in some areas. Also capitalist measures of production (eg: GDP) often take no account of social capital, and the benefits of voluntary work, and ‘intangibles’ (to capitalism) such as free time, happiness and the environment. 15) Left to its own logic capitalism creates great inequality. Certain social democratic policies can ameliorate this without a full transition to a qualitatively different economic system or mode of production. (which is not currently an option) Though we should not feel inhibited in imagining alternatives ; and discussing where current problems could ultimately lead. 16) Firstly, a bigger public sector can actually be ‘good for capitalism’ to a significant degree. Reversion to natural public monopolies in several areas could reduce cost structures, creating efficiencies which flow on to the broader economy. This includes in communications, transport infrastructure, energy, water, and potentially with a single public-sector job search and welfare agency. Cost structures would be reduced because of a cut in waste, duplication and unnecessary or inappropriate competition (eg: in energy) ; as well as because of a superior cost of borrowing for Government. Again there are some areas (eg: energy) where ‘competition’ is ‘anti-intuitive’ for consumers ; and confusion leads to abuse of market power by energy retailers. For policy makers there is also the danger of nepotism through the privatisation process ; including Public Private Partnerships which facilitate the ‘fleecing’ of consumers. 17) Secondly ; while capitalism needs to expand into new markets to survive, at the same time it undermines itself insofar as in its current form it is failing to create full time work for all those who want it. It is also failing to create full employment for all who want it; and indeed depends on ‘a reserve army of labour’ to discipline workers into accepting its demands on wages and conditions. Proactive industry policies should endeavour to create full employment , and full-time employment for all who want it. This involves the more thorough exploitation of old markets and well as taking advantage of new ones. And with real creativity government can act as ‘employer of last resort’ through programs which provide for genuine social goods ; not merely pointless schemes ‘painting rocks’ and the like. 18) Further, strategic government business enterprises in areas like banking, general insurance, medical insurance – could counter attempts by private oligopolies to exploit their market power and fleece consumers. That would mean more disposable income for average consumers upon whose demand the economy depends. 19) Finally, as the Nordics have shown, growing the social wage and welfare state is also good for people ; good for the economy. Greater equality can mean greater happiness ; and also greater consumer demand – as those on lower incomes spend a greater portion of their income. Through these strategies capitalism can be made ‘more survivable, more fair, and more stable’. These do not provide a final answer for capitalist instability and injustice. But ‘with no way out’ for now to a qualitatively better system of production the amelioration provided by such responses is crucial for those who will have to live and work under capitalism. 20) The Social Wage and Welfare State can also contribute to happiness and well-being by providing a living income for the disadvantaged and vulnerable , and support for carers. The social wage, welfare state, and other areas of state provision (eg: infrastructure) can also provide a vehicle for ‘collective consumption’ by taxpayers via the tax system – providing much better value for money than were the associated goods and services purchased by atomised, private consumers. As already alluded to ; the same applies in relation to ‘collective consumption’ with regard natural public monopolies re: certain infrastructure and services ; and in areas of health, education and so on. Even if people pay more tax over the short term, they end up better off – with more disposable income after non-negotiable needs are provided for. The social wage and welfare state demand higher taxes as a proportion of the economy ; but for the reasons stated actually tend to leave most people materially-better-off. And with more choice ; that is, more purchasing power – not less – after essentials are provided for. Democratic Socialists and Social Democrats must look to the best tax mix also. The overall tax mix must be progressively structured. Arguably for fairness corporations and the wealthy must pay more ; as far as it can be sustained. If there are consumption taxes, for example (perhaps to prevent tax evasion), the bad distributive effects of this must be fully offset through progressive taxes and social wage measures elsewhere. A bigger role for progressive income taxes, taxes on dividends, taxes on wealth and capital – is desirable. Social security, welfare and the social wage (perhaps including a guaranteed minimum income) must raise the ‘floor’ of inequality as high as can be fairly sustained. (that is, higher minimum wages, including the effect of the social wage) Currently there is exploitation of the low paid and unreasonable inequality in the labour market and in wealth ownership ; but there are arguments that reasonable reward for effort, unpleasant labour, past study and skill – should be factored in. (as most people accept) There should be much less inequality ; but some inequality is justified even under democratic socialism. Tax can also comprise a ‘lever’ for gradual socialisation over the long term in strategic areas of the economy. Finally the broad Left and Centre-Left cannot morally abide by a system which uses the threat of descent into an ‘underclass’, or classes of ‘utterly destitute’ and ‘working poor’ – as a way of ‘disciplining’ other workers. Neither can we tolerate ‘middle income’ demographics having their material living standards (interpreted here as material consumption) rest upon exploitation of the working poor. What is needed is broader solidarity to the point where there is no class of working poor or utterly destitute. 21) As well the social wage and welfare state can provide the following: High quality, comprehensive universal health care for all ; Providing high quality Education for all – including education for personal growth, political literacy, and hence preparation for active and informed citizenship; as well as education to meet the demands of the economy and the labour market. Other important areas include public and social housing, legal aid , child care, financial services, access to information and communications services and technology , assistance for equity groups , Public sector media such as ABC and SBS with charters to maximise participation, support extensive pluralism, support local culture ; Broader support for diverse local culture, recreation, sport, and so on. Creating ‘the good society’ involves more than ‘hands off’ and ‘leave it to the market’. New needs are also always arising as the economy and technology develop. 22) Further; there is a growing push for a ‘guaranteed minimum income’ for all ; which makes sense given the looming problem of distributing the productivity gains of future automation ; But also providing a ‘basic floor’ below which no citizen will be allowed to fall. Automation is inevitable and governments must intervene to ensure the full economic benefits are passed on to workers and consumers. 23) The emerging economy should provide flexibility where possible on workers’ terms. Again; those wanting part-time work should be so provided. And those wanting full-time work should be so provided. All people should have the prospect of a fulfilling life; with a mix of varied manual and intellectual labour. There should be scope to devote time to personal growth; including creative labour, study and recreation. Industry and labour market policies must aim to update skills, and also strive to nurture new industries which draw on existing skill sets where jobs have been lost. 24) As Professor Andrew Scott explains in his work ‘Northern Lights’, the Danes have a policy they call ‘flexicurity’. Rather than focusing narrowly on ‘flexibility for employers to dismiss workers’, the Danes also emphasised ‘the provision of generous unemployment benefits for those who lose their jobs’ and ‘the provision of substantial and effective Active Labour Market Programmes (ALMPs), [with] quality training to help unemployed people gain new skills for new jobs …’ (Andrew Scott, p. 135, (pp. 152, 154-55). By contrast Australia suffers ‘the lowest level of unemployment benefits in the OECD for a single person recently unemployed.’ Furthermore, ‘Work for the Dole’ programmes are punitive and provide little in the way of relevant skills for job placement. (Andrew Scott ; pp. 136-38). Denmark’s active labour market programmes are expensive says Scott, but are worth the investment in radically higher workforce participation. Achieving an economy which operates at ‘full bore’ – as the Swedes achieved for a significant time – also means more revenue for social programs. Industry policies ensuring more high wage employment also enhanced those outcomes. 25) The Housing Affordability Crisis is driving an economic wedge between Housing Market Investors, Home Owners, and those struggling to (or unable to) purchase their own homes. Simply releasing new land (the traditional Liberal ‘solution’) is not a viable answer unless services and infrastructure investment matches it. Large public and social housing investments in growth and transport corridors could increase supply, however, and if introduced in phases may be able to ‘deflate’ the boom without a ‘crash’. Labor’s negative gearing policies would also mean less competition between first home buyers and housing portfolio investors. Again, combined with increased investment in public housing, and implemented properly, it should be possible to ‘deflate’ the bubble without a crash. Public housing construction should involve expansion of ( largely ‘non-clustered’) public housing stock to at least 10% of total stock over several terms of Labor Government. ‘Non clustered’ stock aims to avoid traditional stigma against public housing, as well as the creation of poverty ghettos. Though there is the opposing argument that (implemented properly ; with the right infrastructure and services) clustered housing can create thriving communities. 26) There are those who argue capitalism cannot deal with looming environmental crises. As a system based upon growth and the production of ever-more consumer goods, with a ‘growing environmental footprint’, there are reasons to take these claims seriously. That said: renewable technologies are advancing. And information, culture and service industries – if emphasised – could involve much less of an ‘environmental footprint’. A guided shift of emphasis to those industries could be key to environmental sustainability. At the same time, though, we want to remain an economy which ‘makes things’. Manufacturing will remain necessary; and working conditions in manufacturing tend to assist the organisation of labour. But we do not know yet just how far automation will go. Automation could be good for people in their capacity as consumers, but bad for organised labour. 27) Finally, Labor needs a vision of ‘the good society’ which includes redistribution and rights of labour – including labour market regulation (with an increased minimum wage); but at the same time goes further. Marxism involved an implied moral critique of exploitation. But also of what was called ‘alienation’; that is, the impact of physically onerous, repetitive and/or mentally punishing labour. And the lack of creative control workers enjoyed over their labours, and the products of their labours. This ‘alienation’ could be addressed partly through increased free time for workers in such demanding areas. And increased opportunities to explore such diverse areas as philosophy, science, art, and leisure. Though Marx also envisaged a time when fulfilling labour would ‘become life’s prime want’. ‘Automation’ could actually create opportunities here IF implemented properly. Also Labor should have an appreciation both of the importance of constitutional liberal democracy; but also of its limits. Democracy needs to be extended into production and work. This could involve support for diverse models of co-operative enterprise and mutualism – on both large and small scales. Not only would this model by-pass exploitation: it could also provide workers with creative control over their labours; including the kind of intimate control and identification that may go with co-operative small businesses (eg: co-operative cafes). Furthermore, mutualist and co-operative associations could contribute to full employment in a situation driven by contextual human need, and not only ‘share value maximisation’ – which is the modus operandi for capitalism-as-we-know-it. Large scale co-operative and mutualist associations could also occupy crucial points in the economy in areas like health, motor insurance, and general insurance, and credit/banking. Government could play a central role of ‘facilitation’, here) Strategic ‘multi-stakeholder’ co-operatives could also be created through co-operation between Government, Regions, and workers. That model might have been applied in the case of SPC-Ardmona ; and may even have been applied (much more ambitiously) to save Australia’s car industry. Ambitious ‘mutli-stakeholder co-operatives’ should be considered by Governments, Workers and Regions for the future. Other options for economic democracy include: growing the public sector, promoting ‘democratic collective capital formation’ (for example, like the Swedish ‘Meidner wage earner funds plan’) – though perhaps inclusive of all citizens and not only workers. As well as ‘co-determination’ (worker reps on company boards). Sovereign Wealth Funds or Pension Funds also socialise wealth and investment, and could be crucial to fund expenditure and investments (eg: infrastructure) into the future. Superannuation is entrenched now, and provided for peoples’ retirement without the political problems of raising taxes. It was seen as having democratic potential; but it also had problems of reinforcing inequality in retirement (also affecting women); requiring low income workers to make contributions they could not afford; and reinforcing the capitalist focus on share value maximisation regardless of other need. Arguably pensions need to be more generous and broad-based; but the superannuation system may lead to the marginalisation of the Aged Pension into the future. In conclusion; we should talk of capitalism and not only ‘neo-liberalism’. Because to name capitalism is to make it relative. And one day the way may open for something better to become possible. At the end of the day all wealth does derive from labour and Nature: and now just as in ‘the Heyday of radical Social Democracy’ this implies a moral critique of capitalism and class. Damn good critique of capitalism, its positive features and its self-ratcheting regressively ramping tendencies. Unfortunately, the moment anyone on the vaguely “left-ish” side of politics raises his/her head above the parapet with a reservation about unfettered market economics there is a chorus of “too far left” and “unsafe!” and everything settles down again, feathers slightly ruffled. It’s analogous to the situation with US – Australian military adventures past and probably, future. What the Libs comfortably embrace without a thought for the consequences for Oz soldiery & families Labor seizes with a fear of consequences for themselves, with the forces’ welfare being considered later. In fact, far too much of Labor’s real (esp once in govt) policy is dictated by fear of what the commercial media will say and it stops them from ever taking a real stand for the less well off. On current actions, I can’t see things changing, and electoral results Labor’s way will only confirm their belief that the fearful way is the safest way. Kim will echo that with enthusiasm. It doesn’t bode well for “Oz – fair” though. Research and innovation are mostly products of the public sector and private companies only provide a marginal contribution. I’m half-way through reading this comprehensive article. I intend to get my teeth into discussing how an increasing mobilised grassroots can work on controlling the negatives of capitalism and reduce the stranglehold of topcat neoliberalists and fascists who pull the strings. Probably the biggest failing of the capital controlling class apart from undermining our mass media and democracy is to insist on national government fiscal austerity which perversely shrinks the private sector along with the government sector, increases private sector and personal debt and reduces consumption demand and general living standards. Monetarism or trickle down economics is in reality also an enemy of the capital controlling class as well as the general population. Substantial ongoing national government budget deficits are generally, apart from some rare economic circumstances, the biggest single factor in ensuring high levels of employment and rising living standards. Some pro capitalist libertarianist economists have accepted the macroeconomic arguments presented by the Modern Monetary Theory economists. A well designed economic development policy, possibly like that of Singapore, and an MMT style job guarantee scheme are also essential. The other points made in this excellent article are all parts of the solution. You wanted some opinions. Your article is rubbish. Try submitting this to the ALP’s policy and platform bodies. Harquebus – I assume you say the article is ‘rubbish’ because it doesn’t discuss the environmental limits to growth as much as you’d like. I also assume you disagree with my conclusion that renewables technologies and a shift to information, services and culture industries could significantly ameliorate the environmental impacts of economic activity. But I don’t deny that the capitalist imperative to growth can involve significant environmental concerns. Indeed I wonder if population growth continues unabated eventually it could become an existential question for humanity. But you don’t really mention what specifically you think is ‘rubbish’. So to be specific: is it the paragraph dealing with the environment? (if so what specifically?) Or are there other arguments you disagree with? And so: what are they? And how and why do you disagree? The article also discusses waste under capitalism at great lengths – which has big environmental implications. Sorry. I thought that you only wanted an opinion. I will respond to your request later today. In the mean time, you are correct in assuming that I disagree with renewables, EROEI mate. Also, there is no eventual existential question in relation to population growth. The question is with us now. Peak oil mate, peak oil. Would you tell us in what field is your PhD? I hope it is not economics. Hi Harquebus ; the PhD was on ‘Third Roads and Third Ways in Social Democracy 1848-1934’. Social Sciences. But I’ve never been one to accept ‘only qualified economists should have opinions on the economy’. That would make us a technocracy rather than a democracy. And in any case it’s just an excuse to write something off without having to engage. That’s how the neo-liberals maintain their hegemony in economics discourse. re: Renewables of course the cost of constructing and maintaining renewables infrastructure has to be considered. A while back I heard of a technology called ‘solar paint’. I am wondering when/if that will actually be made available. It seems to involve very little in the way of inputs to deploy. (though it doesn’t last forever) I’m also wondering how much renewables technology will improve over the next 10 years. I met an engineering student on my graduation day who said the energy retention re: solar technology was going to increase massively over that time. Also you may disagree with the environmental assumptions in the article – but there’s an awful lot more there than that for you to be just writing the whole thing off. I hope other respondents deal with other areas of the article as well as it’s also about a lot more than this. written and is easy to understand for the layman, which is the type of articles needed to educate the masses. Don’t worry, Tristan. Harquebus wants all our articles to be about the world ending tomorrow. If not, he is quick to call them rubbish. Well I could say that H has found someone else to annoy but all he is doing is again destroying a good discussion on what is an excellent contribution to THE AIMN. I have now completed reading your article and concur 100% with all the society-building potentials that are available to us right now with the right focuses on equitable access to the opportunities of the expression of our diverse talents and then the fruits of our labours. Full employment for people who can and want to work in meaningful employment that reflects their talents, skills, qualifications, experience is essential, so that all that human wealth is applied for our common good. Part time work should also be equitably available for those who require it and promotional opportunities should automatically be proportionately available to such participants. As for housing, public housing enterprises are achievable and workable without bursting the seams of our capital cities. Sensible refurbishment of old buildings and industrial zones can be remodeled for public housing that should be at least 50% government-backed rent-to-buy packages, so that low income people on welfare have equitable opportunities to achieve their own home ownership. Regional areas also offer great opportunities for decentralisation. Focusing on this would provide great regional employment and community building. Your article opens up a vast spectrum of great opportunities that would enhance the lives of every citizen. Have you sent this article or even your thesis to Bill Shorten? If so, were you paid the respect of a considered response? Hi Jennifer ; No I haven’t sent it to Bill Shorten, but now that you mention it I will. I do think that if we go down the path of public housing (which we should) that a lot of it will have to be medium to high density around the most important transport corridors ; and invest in the transport and other infrastructure in emerging suburbs. Make sure services are relatively frequent as well. And pursue an industry policy aimed at actually creating jobs in the emerging suburbs themselves ; taking pressure off the new transport infrastructure where necessary. Thanks for your considered response ; I appreciate it. Hi Tristan, a good article that raises important issues. I thought you captured some of the internal contradictions of capitalism well. I don’t however see social democracy as the answer to those contradictions. Rather it papers over them at best, or exacerbates them at worst (when it acts in the interests of capital much as the current and previous Labor governments have done). There is a reason why Labor under Hawke and Keating introduced neoliberalism here, why Blair was a soft Thatcherite, why in more recent times the ghost of SYRIZA hangs over all social democratic groups. It is the very nature of social democratic parties to manage capitalism, and the ALP with its links to the working class through the trade union bureaucracy can often introduce pro business anti-worker policies (painted as pro worker) through using those links. I think the elephant in the room is what Marx identified as the law of the tendency of the rate of profit to fall, something that flows from the very way capitalism is organised. As profit rates in the developed world began to fall in the late 60s and early 70s the move of all the mainstream parties was from Keynesianism to neoliberalism. 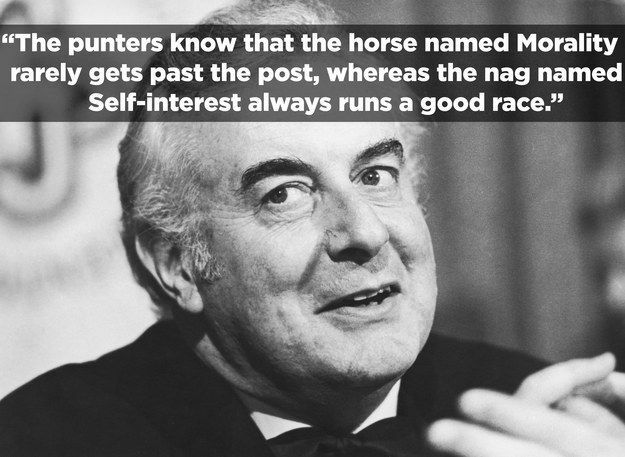 Labor in Australia led the charge, for the reason mentioned above. Given the failure of neoliberalism to restore profits rates in many sectors to post war levels despite 30 to 40 years of trying, I think that means the economic base (but not the political base) for social democracy is dead. What about democratic socialism, John? I’m currently reading “Utopia For Realists” which, while not perfect, certainly challenges some of the things we take for granted and raises a number of questions that we should be asked. I started to write a piece about the links between the Poor Law 1834, Work-for-the-Dole and the way we organise schools, but then I realised that I probably needed to spend about another ten thousand hours collecting my thoughts. Then I was tempted just to write down the questions and blog them! Thanks for the excellent article, this site it is getting better and better. I was going to ignore this article until Tristan asked for opinions and I gave him mine. My apologize for the delay in responding. One can talk about capitalism, socialism, democracy, neoliberalism, politics or whatever; unless reducing energy use and population growth are at the core of any discussion in regards to the remedial action required to salvage some semblance of civilized society, you are wasting your time. The only humane way to achieve these goals is voluntary population reduction. Our current economic system is based on debt fueled growth. Debt created from nothing and expected to be paid back with interest on diminishing energy returns. Ha! Repaying this debt is impossible. The current low interest rate environment is an attempt to delay this inevitable default. Your article assumes that things will continue in some way as they are today. They will not. If warfare doesn’t get us first, it will be the default induced collapsing economy with the latter my preferred. For the natural world at least, economic collapse can’t come soon enough. We are going to have high unemployment, social and infrastructure decay, loss of services and shortages of everything. Only by cooperating at the local level will one cope and survive. There isn’t going to be an economic system and there will be no transport and there will be no trade. There will be a lot of hungry and destitute people. I have not mentioned resource depletion, climate disruption nor environmental destruction which, if I did, would be here all night and are all compounding factors. What are you going to do? Like most, you will probably be f*cked and you your ignorant Labor Party policy wonks will not save you. Your grand plans for a better future will be just that. 1: Forget economics. It is “fatally” flawed. It has polluted the planet, poisoned us all, does not factor physics nor the environment and is what has got us into this mess in the first place. 2: Implement national and encourage international population reduction strategies otherwise, one way or another, nature will drag us back to sustainable levels and it won’t be pretty. 3: Properly manage our finite resources which, are currently being pillaged. 4: Reduce consumption using quotas and not with unfair taxation. We can not shop our way to sustainability and we can not borrow our way to prosperity. 5: Plant lots and lots of trees. Massive scale reforestation will help the climate, rainfall and be a valuable renewable resource for future generations. 6: Restore the liberties and freedoms stolen from us by corporate serving politicians. His pithy book lays out the grim context. The new global drama of eroding democracies and failed states, he says, can best be explained by a radical energy story that the media ignores or doesn’t understand. Debt brings future spending to the present. Unfortunately, borrowers of the past have beaten us to it. thanks John ; I’m aware of the tendency of the rate of profit to fall – though my understanding is a simple one I admit ; That is – that competition forces innovation of the means of production – driving increased productivity ; But as this investment in the means of production increases proportionately this leads to a fall in profits. Surplus value comes from exploitation of labour ; and so as automation/mechanisation increases the rate of profit falls. That is I try and argue this in point 10. What follows will be less certain ; because it’s my own reasoning. Sorry there’s a fair bit of repetition from the article proper – which I realised after finishing this…. Monopoly capital can try and hold profits up by fleecing consumers ; but even an oligopoly can upset this unless there is collusion. And even if there is collusion there’s the problem of what happens to the rest of the economy. If monopoly capital fleeces consumers to prop up the profit rate that affects the consumer base. Consumption is impacted in the broader economy. The reduction in overall demand impacts upon the profits of capitalists more broadly. So what can be done about all this? As I argue in the article capital can increase labour intensity. That’s one of the worst and most unacceptable strategies. Industry policy can capture a larger portion of the ‘high wage pie’ in the global economy – but *someone* has to do the low-wage jobs, and arguably there are only so many high wage jobs to go around. Industry Policy can also create full employment and increase the participation rate. That increases overall demand – an expansive influence which can restore profits. Consumer co-ops can also force parasitical capital to offer a better deal. Bernstein talked about this. But all the better through ‘collective consumption via tax’. And the public sector can claim a significant share of the property market by increasing its stake, say, to a minimum 10 per cent of stock. Full employment creates ‘economies of scale’ for capital as well as labour. Capital has a larger consumer base ; stimulating growth ; and keeping business viable. Labour can also ‘claim its share of this pie’ ; hence wages can increase literally and proportionately. This is close to the example I like to think of ; of the ‘Rehn-Meidner’ model in Sweden ; though eventually this was upset by supply shocks (increases in the price of oil) ; and increase competition in high wage manufacturing markets. none of this solves all of capitalism’s problems. But it ameliorates them significantly for the workers, consumers, citizens – who will likely live their lives under capitalism whether we like it or not. John ; what I would like to know, though, is how can socialism put a permanent end to capitalist contradictions? How is it possible politically – because of the integrated global economy today? ; and because of political, economic, and ultimately military pressures? Also what would the effects be of removing the competition dynamic from the economic entirely? I tend to think in terms of socialising specific sectors ; and extending the socialised sector gradually – but leaving a significant sector to the capitalists. Because its practically impossible to expropriate those capitalists right now. And there is a shared influence in avoiding a conflict which hurts the system ; but does not lead to socialism ; which leads to the exhaustion of both capital and labour. (though historically in such ‘showdowns’ labour has lost often – think of the circumstances of the ALP’s formation) I think in terms of Korpi’s ‘democratic class struggle’ ; and also his ‘Power Resources Theory’. But beyond this I don’t see ‘a definitive way out of capitalism’. Do you? We can be completely uncompromising – but where does that lead? (so long as a complete transition is politically, economically – and militarily impossible) If our aim is to be so disruptive that ‘capitalism fails’ – are we honest with workers that what they get in practice could be barbarism. Because we can disrupt – but politically and militarily we cannot enforce a transition. We need to be honest about it though ; and strive to organise and educate. Which means some people HAVE to be OPENLY RADICAL. Restoring a GLOBAL and ‘democratically disciplined’ Left – on the basis of a shared minimum platform and program – is the first step towards challenging those obstacles. Gee Harquebus why do you keep using ‘discredited’ economic concepts such as ‘debt’, ‘default’, ‘interest’, ‘economic system’ and so on while using those very same concepts to make your ‘argument’ – again and again and again … and then again and again and again … Without seeing the irony. As for ‘cheers’ – I suspect most readers now give it a meaning way beyond your intention or its regular use. Talk about trashing the ‘brand’. Harquebus I actually agree with some of your points. Technology may save us from over-population – But then again maybe it won’t ; New Technology may solve resource shortages ; but can we go on like that forever? Mass forgiveness of debt may be the only way to deal with the growth of indebtedness ; and in Australia private and household debt are the biggest problem. (much bigger than govt debt) Agree re: reforestation ; Agree: protecting liberties. re: transport and trade ; A war could destroy trade ; but transport infrastructure no doubt will continue. Peak Oil is real ; but what of the viability of future renewables? Perhaps in the future there will be the need to prop up the economy through the public sector, public infrastructure, even planning. The crisis you’re suggesting could force the world to co-operate as well. It might be necessary to force a negotiated resolution to the global debt trap. A much more egalitarian economy means technically we can maintain living standards while maintaining ‘a steady state’. But is it politically possible? Not to mention corporate obstruction ; and at the worst military defence of corporate interests. Gee, maybe it’s because it is the failing economic system that we are currently using and not likely to change. Technology will not save us. The logistical supply chains will not be in place to facilitate it. The transport infrastructure is going to deteriorate and the viability of future renewables, no such thing by the way, is a gamble that is unlikely to pay off. There isn’t going to be an economy. There will local trades and barter between much smaller population groups. Most here do not understand; it is too late to prevent calamity. The only option now available to us is to prepare for it and I do not see this in any Government nor Labor Party policy so, we’re screwed. Prepare to take care of yourself because, there will be no government and associated services that we currently take for granted and there will be no supermarket shopping. If our populations were much smaller and our natural and finite resources conserved as much as possible, this is kind of lifestyle that I think might be feasible and would accommodate the six requirements that I suggested earlier. Again, not on any policy document that I know of. sorry for some typos in my comments. Tristan, may we add your blog to our list of affiliated sites? Sounds ok ; What does it involve? I just put in a link to your site. I wanted to ask you first. Michael I know its off the front page now but is there any way you can put it in my name? Just so its clear in the archives.